Bluetooth is an important protocol used to transfer files from Computer or Laptop to Mobile Device. Images or Mp3 songs can be transferred efficiently using this wireless protocol. Instead of connecting Laptop and Mobile Device with a cable, Bluetooth which has wireless advantage is most preferred. The default Bluetooth Software in Laptop supports transfer of files to only an individual Bluetooth Device. 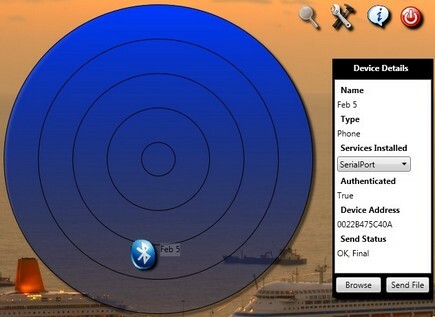 If you want to transfer files to Multiple Bluetooth Devices then Bluetooth Radar is a program specially meant for you. Bluetooth Radar will detect multiple Bluetooth devices and transfer Images and songs faster and easily.